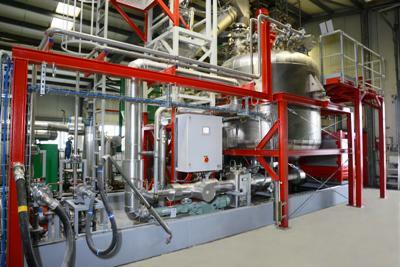 Pirmasens, December 13, 2012 – A key player in the industry, RAMPF Ecosystems has been operating the world’s first industrially usable plant for manufacturing polyols from PU flexible foam waste since April 2012. High-quality raw materials can thus be recycled for the foam manufacturing industry using the acidolysis process developed by RAMPF chemists. The loss of valuable raw materials and high disposal costs resulting from waste materials in production processes are now a thing of the past. Thanks to innovative chemical processes such as the acidolysis process developed by RAMPF specialists in 1999, it has even been possible since April 2012 to recover polyols industrially from flexible slabstock foams and flexible moulded foams. Since the start of 2012, RAMPF Ecosystems in Pir-masens has been recycling large quantities from renowned Memmingen-based slabstock foam manufacturer Metzeler Schaum. Using the new process and innovative plant tech-nology, RAMPF is expanding the potential of chemical recycling. The world’s first usable industrial plant was designed and completed as part of a project funded by the German Federal Ministry of Education and Research to develop industrial-scale acidolysis for flex-ible slabstock foams. Skills networks are the recipe for success for groundbreaking innovations. That is why RAMPF Ecosystems in Pirmasens, Metzeler Schaum in Memmingen, and Keil Anlagen-bau in Hunteburg have worked closely with Fraunhofer ICT in Pfinztal. The result is a high-tech plant that offers a capacity of around 3,500 metric tons per year. These types of plants can also be used on a decentralized basis to recycle raw materials directly at and by foam manufacturing companies. In these cases, RAMPF Ecosystems provides the chemical know-how and coordinates the plant engineering. Slabstock foam producers can therefore ensure cost-effective, sustainable production locally that helps deliver active environmental protection. The acidolysis process was researched intensively in 1994-97 in collaboration with Aalen University and developed further by RAMPF Ecosystems in the years that followed. The initial positive findings from a joint research project on recycling TDI and MDI molded foams were published in 1999. Applying the process to recycling flexible slabstock foams and processing secondary polyols on a technical service center scale represented a fur-ther milestone and this was unveiled at UTECH 2009. In addition to further development of process engineering aspects, the process and plant technology for the acidolysis process was also optimized and implemented with technical innovations. RAMPF succeeded in scaling up the process from technical service center scale (10 kg, 100 kg) to semi-industrial scale (1,000 kg) and up to industrial scale (7 t/batch). In the face of rising raw material prices, RAMPF Ecosystems has been designing recy-cling solutions to recover raw materials from polyurethanes for all kinds of requirements for the last twenty years. “The way we think and act is focused on customer needs – a fact that derives from our many years of experience in the polyurethane sector. We’re con-stantly exploring new approaches that give us the edge in innovation,” explains Marco Werth, Sales and Marketing Director at RAMPF Ecosystems GmbH & Co. KG, a RAMPF Group company. And the aim throughout is to enable recycling of all polyurethane waste in terms of process engineering while also factoring in economic considerations. The variety of opportunities and the potential of polyurethanes opened up by Otto Bayer’s invention in 1937 are still far from exhausted. Year after year, new, innovative develop-ments and solutions are being found using this versatile material, with the result that de-mand for raw materials is growing continuously. Demand for options to recover raw mate-rials is thus increasing in equal measure.